On December 24, 1937, writer and cultural leader Mary Van Landingham died in Charlotte. Born in Charlotte in 1852 to a family with deep roots in the area, Van Landingham made a name for herself by becoming active in several civic and cultural organizations, including the Daughters of the American Revolution, North Carolina Society of the Colonial Dames and North Carolina Folklore Society. The first woman to be invited to speak to the N.C. Literary and Historical Association and the Mecklenburg Historical Society, she is perhaps best remembered for a speech she gave to the latter group in March 1900. During that speech she attributed North Carolina’s relatively unimpressive literary output to the fact that the state was a “Vale of Humility between Two Mountains of Conceit,” those “mountains of conceit” being the states of Virginia and South Carolina. Van Landingham’s comments were widely reported in the press and became part of the popular lexicon used to describe North Carolina’s cultural scene. 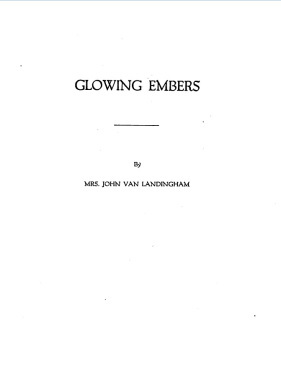 Though an outspoken commentator on North Carolina arts and culture, Van Landingham was a fairly successful writer in her own right. Throughout her life she wrote newspaper articles on current events and historical topics, and in 1922, she published a book of essays, articles and speeches.